Blog about buying plastic mold, plastic injection molding parts from China Plastic Injection mold and molding companies, advantages and disadvantages buying plastic molds and plastic molding parts from China. What Is high volume Injection Molding? Plastic injection mold press is simple called press. Plastic injection mold press holds the plastic mold in which the components are shaped. Mold press is rated by tonnage, which expresses the amount of clamping force that the machine can generate. This pressure keeps the mold closed during the injection process. Tonnage can vary from less than 5 tons and big than 5000 tons, with the higher figures used in comparatively few manufacturing operations. Plastic injection mold is the primary process for manufacturing plastic parts. Although the tooling of plastic injection mold is expensive, the cost per part is very low. Today most of the companies are looking for mold manufacturer China suppliers to reduce the mold cost. Plastic injection mold is a popular and economical industrial process for manufacturing a wide range of plastic consumer products. These include knobs, washers, valves, pulleys, gears, power tools, bottle caps, toys, car panels, computer monitors, keyboards, furniture and so on. These items are mass-produced using molding machines of various sizes and various specific requirements. Injection molding molds are widely used in many businesses that deal with plale raw material shaping. Injection molding molds themselves are hallowed-out blocks that are filled with a liquid like plastic, glass, metal, or ceramic. Injection molding molds can produce several copies of the same arts in a single shot. The liquid hardens or sets inside the molds adopt their shapes. Injection molding molds consist of two primary components: the injection molds (A plate) and the ejector molds (B plate). These molds work together to form the shapes that you want. Plastic injection moulding machine is the most important machine in your business if you are planning to have plastic injection moulding method in manufacturing your plastic products. Through this machine, your company could manufacture a lot of different types of plastic products in 2D and 3D. With the help of plastic injection moulding machine, a lot of different plastic products could be produced from your company. Custom plastic injection molding will give you reliable and effective cost in a plastic injection molding process. In this process, most plastic and materials are produced. It produces smooth and finished products that require no further finishing. Custom plastic injection molding has always been a fast moving, disordered and demanding business. It will give you many advantages. Every injection mold has to have a gate, or an opening through which the molten plastic is injected into the cavity of the mold. The type and size of gate plays a very significant role in the process of injection molding and must not be overlooked. In the custom injection molding business, margins are extremely tight. 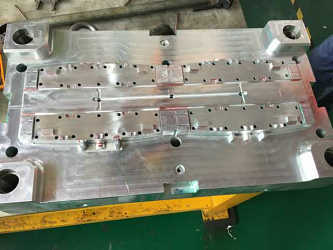 This requires the mold maker to make a very accurate determination of the size and type of gate for the injection mold. The wrong gate can spell disaster, or at least reworking the mold, which can quickly eat up profits. Custom plastic molding is a method used for making parts from both thermosetting plastic materials and thermoplastic in production. Through this process, plastic is injected at high pressure into a mold which is the inverse of the shape of the product. Custom plastic molding is generally used for manufacturing a variety of parts, from the smallest component to packaging. Rapid injection molding is a popular manufacturing technique that has been idolized for years. Rapid injection molding is similar to conventional molding, yet different enough to affect how parts are designed. This technique lets companies quickly get low-cost and dimensionally accurate prototypes as well as low-volume production parts from plastics. Do you know the name of the process by which most plastic solid materials are produced? It is called Injection molding. It is a simple process. However, the process may require practice for efficiency. What is the process of Injection molding? During the process of plastic injection molding, the plastic is heated till it melts and is introduced, under pressure (injected), into a mold. The mold may be made up of any metal such as steel or aluminum. The molten form is then allowed to cool down and set into a solid form.